I started ordering products a few months ago to help mend a 3 1/2 year relationship. I needed a little help, so I ordered a setting of lights. It took 5 days for my candle to burn, and another 3 days for my burn report to be sent. It offered great insight and did exactly what was intended. I never expected a miracle, only the truth. If the situation is pure and meant to be, it will be. If not, you will get that answer too. 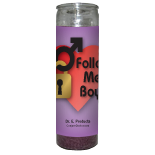 About 3 or 4 days after my Follow Me Boy Candle was completed, he asked me to marry him again, out of the blue! I am very pleased with my results. Date Added: 09/27/2017 by B. L.